This second volume follows the critically acclaimed and best-selling Volume I, but is far from being only a continuation. Thanks to different types of viol (treble and lyra) and particularly inspired rhythms coming from Frank McGuire on bodhran (an Irish frame drum), Jordi Savall has enriched his vision of this fascinating repertoire. Andrew Lawrence-King offers a perfect counterpoint on Irish harp and psaltery. 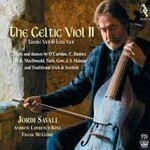 This album is organised in seven sets and enables us to discover many sides of a repertoire Jordi Savall explores with the steadiest and most respectful hand.